all started in a very humble way, when three students were admitted and made the beginning of an educational journey, which today has grown up to over 60 Schools, Colleges and Learning Centres spread over the entire Garhwal-Hills in Uttarakhand and having more than 5000 students. It was through His blessings and His wishes for excellent educational facilities, and because of the long standing requests of the people in this holy area, that Paramahamsa Omkarananda Saraswati provided everything for the establishment of all these educational Centres. On 1st December 1983, on the request of Swami Omkarananda, a powerful Yajna was conducted by the Sannyasis of Omkarananda Ashram Himalayas, which marked the foundation of the first English Medium School in this area, with the name "Omkarananda Saraswati Nilayam". Already one year later, the demand for admission of more children became so much, that a bus was needed to bring the children to and fro. Today four buses are covering Rishikesh, Lakshmanjhula and IDPL areas. Within no time the school became very popular due to its excellent facilities. There is always a heavy rush of new students, seeking admission. The grand reputation, due to the hard work by Swamiji, providing a very good educational setup for Omkarananda Saraswati Nilayam, spread like a fire in the hilly area of Garhwal. From many places in the villages the demand for opening more Omkarananda Schools became more and more urgent. A delegation of parents, in the year of 1989, brought the request for opening a school in Agrakhal, which is situated around 1.5 hours from Rishikesh, on the New Tehri Road. After considering this request the school was adopted, established and finally with a nice celebration inaugurated, on 21st September 1989, and named as "Omkarananda Kunja Shishu Niketan". This school made the very beginning of schooling in the interior of the Himalayas. Omkarananda Kunja Shishu Niketan became like a role model. Within a short span of time endless requests for opening more Omkarananda Schools poured in and were accepted as far as it was possible by Swamiji's kind-heartedness for providing more essential facilities, even in places, where one has to go on foot or travel on horse more than 12 kilometres, in a stony hilly area. Omkarananda Schools, as they are known in the Hills, became a matter of good quality teaching. In many occasions students of these schools stood in the forefront. Thanks to the facility of providing buildings or schooling materials, many a young talent had a chance to come forward and be successful in life. The pressure of opening more schools increased day by day. Today over 174 applications for opening Omkarananda Schools in different villages are waiting for the blessings of Swami Omkarananda. To give students the possibility for higher studies, Gurudev made it possible to establish an excellent "Omkarananda Institute of Management & Technology". 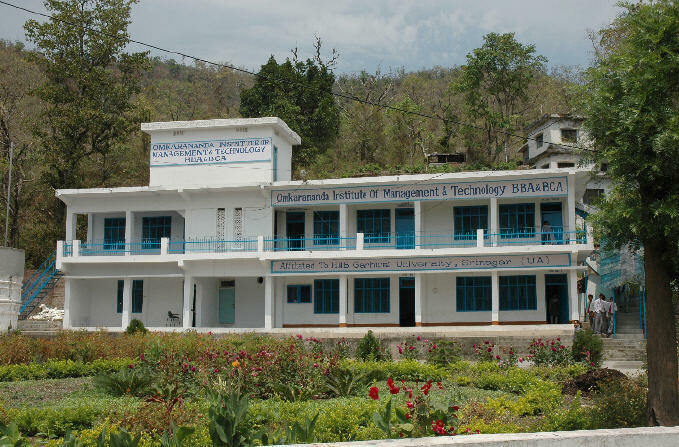 It is the only one in the Rishikesh area, which is having MBA facilities. Besides MBA, BBA, BCA and B.Ed. courses are available in this Institute. The Management is trying very hard to make it possible for the advanced students to be placed in good industries so that they can use the skills, which they learned in our Institute. The cultural activities in India are very very dominant, interesting and full of enthusiasm. Swamiji has requested Kumari Somashekhari to establish the "Omkarananda Saraswati Natya Kala Academy", an Institute for Indian Classical Dance and Music, which got recognition and affiliation from Prayag Sangit Samiti, Allahabad. Children of all sections have the chance to learn various arts in different dance styles and music. The most wonderful aspect is the fact, that numerous students, who have studied in one or the other School or Institute of Swami Omkarananda, have got the great touch of His blessings, and could make use out of the educational facilities given to them and now have established themselves in admirable and fit positions. Every success of each individual is a glorious flower to the Holy Feet of Shri Paramahamsa Omkarananda Saraswati, who selflessly, tirelessly made everything possible for a young generation to get a beautiful future. It was Swami Omkarananda's wish to establish beautiful temples in this area and many, many educational institutions. His vision was, that every village in the Garhwal Himalayas should be blessed with an Omkarananda School. The name "Omkarananda" stands for high class quality. We do not only want our students to excel as brilliant students, but we also want to make them morally and spiritually sound with the help of the teachings and blessings of Shri Swami Omkarananda, so that they may shine as exceptionally capable and divine leaders in their field, all over the world, for the benefit of the whole world. "I will not stop the activity of my being, not rest idle, until every creature in Creation and all of the Creation itself, is touched with the Light Eternal, until every individual entity gains in living experience the Love, the Peace, the Happiness and the fulfilment of the infinite One." To include in educational endeavours not only intellectual training, but to aim also at the upliftment of all powers in man, under the guidance of highest religious endeavours. To found many departments, individual sections which are in function equivalent to faculties of a University, and which will be extended when the institution outgrows its present initial state of development. To give courses about comparative religion with a view to building a world of harmony and unity among religions. To arouse the enthusiasm of children for greatness in every direction, and for the value and the joy of God-knowledge. To inspire the Youth with the vision of Perfection, with the knowledge of the potentialities of Perfection that reside in the Divine Principle in them. To offer to students the opportunity to come after conclusion of their studies to supplement their acquired knowledge.